This brilliant device is an amazingly versatile kitchen tool that will make food preparation a very quick, very easy and very enjoyable experience. 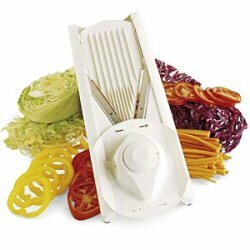 The V Slicer easily does the work of a whole set of knives and appliances – it chops, chips, slices, dices and shreds. Here’s why it’s called the V Slicer - the super-sharp blades in the shape of a V. They’re so sharp that you don’t need to use any effort at all. You choose whether you want to cut thin or thick – it’s as simple as turning the insert over. These blades are so sharp you don’t want to get your fingers anywhere near them you won’t because it’s has a clever safety holder. Your hand is completely protected and doesn’t go anywhere near the sharp end. You can dice, slice, grate and make beautiful presentations all with the one contraption. And it’s only $89.95 plus postage and handling. Less than 90 bucks for the versatile V slicer, 3 blade inserts, the grater and the miracle spiral.